The above image is a new packaging of the same perfume,apart from packaging everything is same. Hey guys its always fun to be back with a blog post and every-time with something new and special product . I am just loving every bit of writing a blog as all the reviews are of my most favorite products which I have been using since few years now. The review I am going to do today is my most priceless possession and it was gifted to me by one of my friend on my birthday. Don’t you think birthday’s are the best part of year as you receive so many gifts and I just love receiving gifts loll!! who don’t. 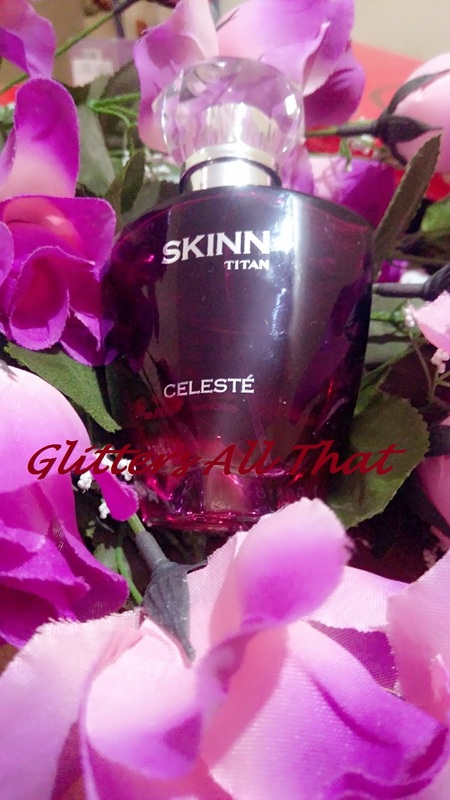 So guys today I am going to review SKINN TITAN CELESTÉ WOMAN EAU DE PARFUM. One thing I would like you to know is that everyone has a different choice of fragrance some love strong some love light some fruity and some flowery. Here I am just sharing my views about the type of fragrance I like the most. Before starting review let me tell you something important about this perfume it is created by renowned French Perfumer Harry Fremont if you don’t know who he is google it and you will be amazed. Now let’s start the review. 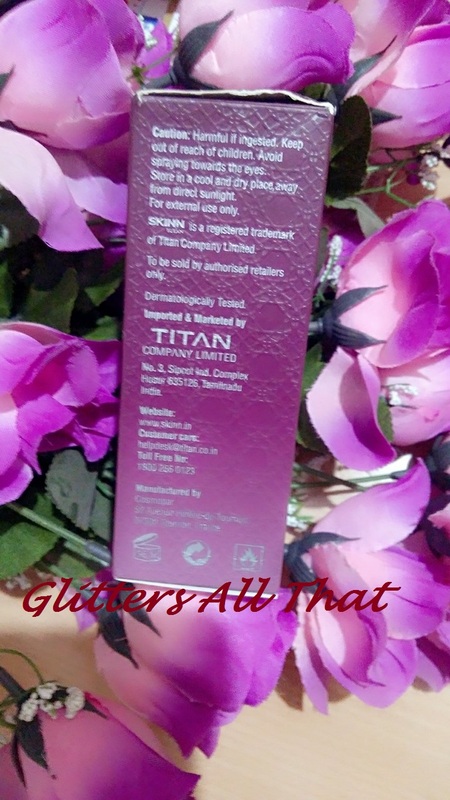 SKINN is a registered trademark of Titan company limited. It is Alluring,Exciting,Chic. The white floral notes accentuated with heavenly Jasmine and vibrant Blood Orange speak of a relaxed sensuality. The sharp piquancy of Ginger, the subtlety of Amber and Apricot conjure up a women of many passion. It is made in France and dermatologically tested.A celebration of a woman’s beautiful complexity.Mandarin and grapefruit capture joyful spontaneity,while Jasmine and water lily evoke a sense of mystery.Tunisian orange flower,amber,apricot and musk sing odes to her eternal luminosity. 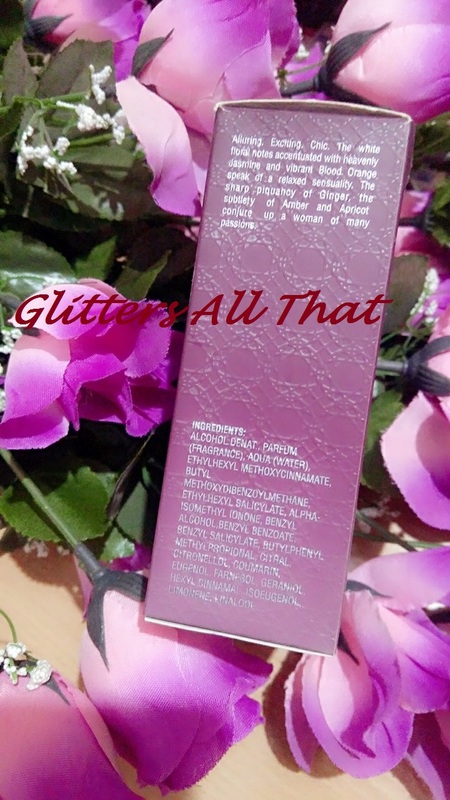 Though I have shared the image of the ingredient but it’s not clear so I am listing all the ingredients here- ALCOHOL DENAT, PARFUM(FRAGRANCE), AQUA(WATER), ETHYLHEXYL METHOXYCINNAMATE, BUTYL METHOXYDIBENZOYLMETHANE, ETHYLHEXYL SALICYLATE, ALPHA-ISOMETHYL IONONE, BENZOATE, BENZYL SALICYLATE, BUTYLPHENYL METHYLPROPIONAL, CITRAL, CITRONELLOL, COUMARIN, EUGENOL, FARNESOL, GERA NIOL, HEXYL CINNAMAL, ISOEUGENOL, LIMONENE, LINALOOL. 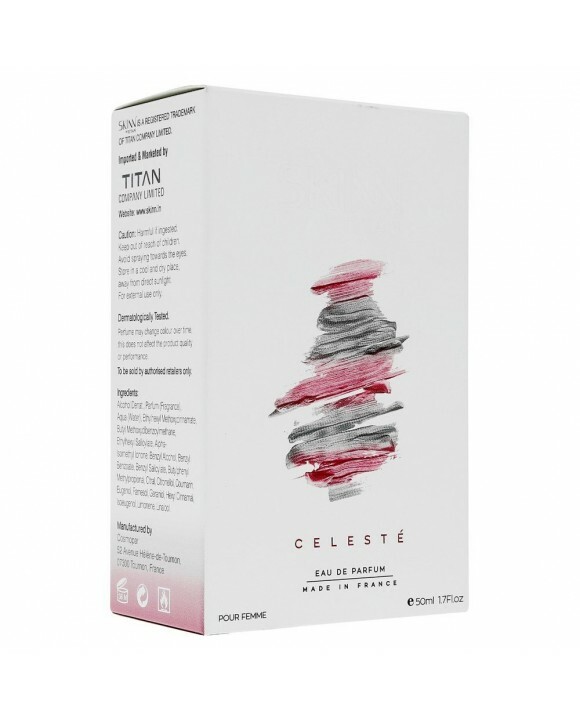 SKINN TITAN CELESTÉ WOMAN EAU DE PARFUM comes in a maroon color packaging and perfume comes in transparent glass bottle with a diamond shape cap on it. The perfume belongs to the woody family and has such a feminine fragrance. Fragrance of a perfume is neither very strong to make you center of attraction nor very light that nobody feels your presence.It is quite soothing and alluring and lingers for around 10 to 12 hours. I would like you to know that all the perfumes have a symphony i.e it has a beginning,middle and an end. Mandarin,Pear,Grapefruit,Ginger and Blood Orange which provides you the fruity fragrance and gives you the sense of joyfulness and spontaneity. Jasmine,Water lily ,Floral Nectar and Tunisian orange flower provides you a floral fragrance and evokes a sense of mystery. Sandalwood,Amber,Apricot,Nectar and Musk makes it a perfect to feel a woman of many passions. Well I was never a perfume user before but after having this I feel everyone should have a good perfume which matches your personality in your everyday essentials. I would definitely rate it 5/5 without any doubt. I would definitely give it a high buyer rating and if you love a mixture of fruity and a floral fragrance then you should really go for it plus having a perfume which is created by the such a renowned and celebrated French perfumer Harry Fremont at this price makes it a luxurious possession. Hope you have enjoyed the review see you all soon till then have lovely days ahead. Subscribe through email and follow me on social media for all the updates.